The new plain YQ by Yoplait has just 1 gram of the sweet stuff. As far as yogurt consumers go, I'm a big one. Early-onset osteoporosis runs in my family, but since I don't eat a lot of cheese or milk, I make a point to have at least one serving of yogurt every day, if not two, to make sure I'm getting plenty of calcium. But recently, I read a staggering stat that the average American woman consumes around 80 grams of sugar a day—that's more than triple the 25-gram max the American Heart Association recommends. I started scanning the labels on those little containers more carefully and soon realized that many of my go-to flavors had a surprising amount of sugar; some contained upwards of 15 grams per serving, an awful lot for the first meal of the day. It's smart to be aware of the amount of sugar in your yogurt, says Wendy Bazilian, DrPH, RDN, a registered dietitian nutritionist in San Diego and author of Eat Clean, Stay Lean ($22; amazon.com). "Flavored yogurts can have three to six teaspoons of 'added sugar' and will range from nine to 35 grams total in some instances," she says. "If you compare a plain yogurt, which has naturally occurring milk sugar (lactose) to a flavored counterpart, you can start to get a sense of how much added sugar it has by subtracting one from the other; this can show you how many grams of extra sugar the flavored variety has." When in doubt, nutritionist Stephanie Middleberg, RD, of Middleberg Nutrition in New York City, recommends choosing your own toppings to control the amount of sugar. "When buying yogurt you want to look for something that has 12 grams of sugar or less," she tells us. "Your best bet is to go for plain yogurt and add your own toppings like fresh fruit, ground flax, chia, hemp seeds, nuts, pumpkin seeds." 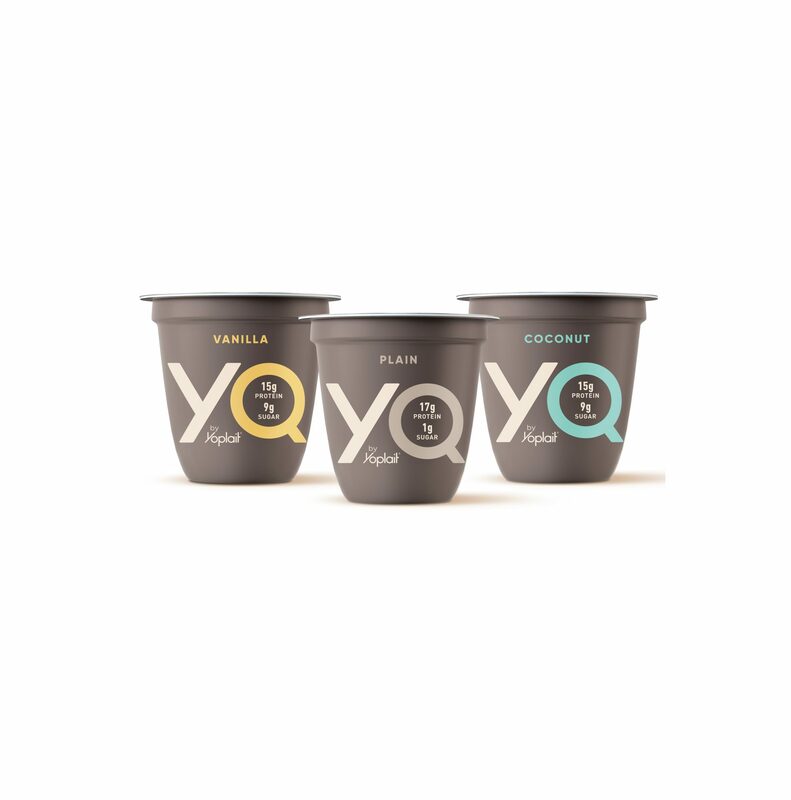 If, like me, you're mindful of how much sugar is in your yogurt, you'll be excited to learn that Yoplait is launching a new line today called YQ by Yoplait that contains less of the sweet stuff. Flavored varieties (coconut, peach, mango, lime, strawberry, blueberry, and vanilla) have 9 grams of sugar in a 5.3-oz. container, while the plain variety has just 1 gram. Yes, you read that correctly. If I'm being completely honest, I usually pass over Yoplait in the dairy aisle—I prefer a thicker yogurt like Greek or skyr, and my past impression of the brand was that it was a little too sweet and light for my liking. But 1 gram of sugar in the plain YQ variety is kind of a big deal; for comparison, both Fage Total Plain 0% and Chobani Non-Fat Plain have 5 grams, while Siggi's Plain 0% has 4 grams. So, when the Health team was offered early access to YQ samples, I was excited to see how they compared to my tried-and-true faves. Texture-wise, I found YQ to be somewhere in between the consistencies of Chobani and Siggi's. It's definitely thicker than original Yoplait, but not quite as dense as Fage Greek yogurt or most brands of skyr, for example. As for the taste, I was impressed. (Although, full disclosure: I am accustomed to the taste of plain yogurt. If you often reach for sweeter varieties, it might be a little tart for your liking.) When I'm in the mood for something a little more flavorful, I'll go for the vanilla, which is creamy and subtly sweet. Although she hadn't yet tasted it, Bazilian, tells us that the ingredient list on the new products looks promising. "Compared to many [yogurts] out there, it is a lot lower in sugar, which is a great improvement," she says. Also good, Bazilian tells us, is that the YQ yogurts have a significant amount of protein (15 grams) for a "reasonable" amount of calories (130). "It looks like it has a clean label—good ingredients and no 'gimmick ingredients.'"